Just how next-gen is Watch Dogs, Ubisoft's open world hacker's paradise? Watch Dogs is looking to be the ultimate next-gen game of the year and despite the delay and seeing its share of controversy, it might actually pull it off. With a year of hype under its belt, you probably already know that you'll be playing in third-person as Aiden Pearce, genius hacker and vigilante out for revenge. The game was originally set with a near-future timeline during the early stages of development, but the story has caught up over time and actually begins in 2012. You'll also be running around in an alternate Chicago - one that is monitored by the Central Operating System, or ctOS, which has stats on every single person and access to every single piece of tech, making hacking all the more easy. Because of ctOS, each NPC will be equipped with their own set of personal information, and again will be hackable. To make it clear, that's literally an entire city and its population you can interact with. 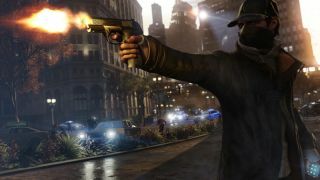 With so much going on, it's easy to see why Ubisoft Montreal has been touting Watch Dogs as the future of next-gen, open world games but does it really have what it takes to beat out the likes of its main competition, Grand Theft Auto V? After playing a solid five hours of campaign, multiplayer and the mobile cross-platform app on a Nexus 10 and PS4 at the Ubisoft loft in San Francisco plus speaking to Lead gameplay programmer, David Therriault, I think Watch Dogs will definitely have you howling for more. So did the PS4 and Xbox One actually have any influence over the creation of Watch Dogs? Therriault says not really at all, at least when it came to designing the gameplay. "We pushed graphics, we pushed the weather, we pushed the water, we pushed the traffic simulation. [With the] behaviors of civilians, we [were able to] push the reactions. A lot of things, like computationally that were really heavy on the CPU before that, we pushed and the GPU, memory aspect of the next-gen consoles, especially on the animation side and on the texture side." "There's more variety on animation let's say, for different reactions to different things in the city. Everyone's not going to react the same. They're going to have some random behaviors depending on their personality and their backgrounds and where they're set. You're not going to encounter the same person twice usually." Similar to the GTA franchise, people walk around and say different things to an extent, but in Watch Dogs, you likely won't see identical ctOS information when traveling the map. The combination of hacks to play missions - 75 according to Ubisoft - also makes the game seem infinite. Before the availability of the consoles, the team had already factored in a certain amount of run-throughs of missions but with the consoles in the picture, Therriault notes they were able to include more gameplay possibilities. "There are multiple gameplays we were able to push into the game. Before we were only able to have a few gameplays possible within the same game. What we tried in that one, which is pretty massive, is connecting new gameplays together that existed before but were never really combined. We tried new combinations; we saw stealth games and combat games before, where some games combined both but stealth driving was not really something that was explored. But we had some stealth, we had some driving, we had some combat - so let's try [to see] what it all could do." From my own play through, I found this to be maddeningly true; I ended up replaying missions over and over just to see how many times I could do it differently. With all the various entry points made possible by the cameras and hackable objects - like making a vent explode or setting off an alarm just to see what happens - to the guns blazing method, each time was definitely different. The Montreal team, responsible for the Assassin's Creed franchise, also allows you to climb on almost anything - see a box or a planter? Get on top for a better vantage point. You'll likely see a camera sitting in a corner that you can hack. These also make for nice little hiding spots when you're on the run. Because of the next-gen consoles, Therriault says, "These are the kind of things on the gameplay side that we can try to push forward with the new hardware now." If you're worried that you won't be able to experience a next generation game to its full extent because you have a PS3 and Xbox 360, it's safe to say you'll still have a jolly good time. You'll get a sort of HD visual experience on the next-gen consoles, but the mechanics and the immersion of the game remain the same; you can still hack away at practically every little thing to your heart's content. If you're wondering "why even bother with the new consoles when everything can look better on the PC," the answer is obvious: everyone gets to play. Which is entirely the point of Watch Dogs and its hyper-connectivity. Watch Dogs comes out on May 27 and will be available on PC, PS3, Xbox 360, Xbox One, PS4 plus the Wii U in the fall.